Astral Artists has today announced the four winners of its 2018 National Auditions – in Philadelphia, United States. This year’s winners will join the esteemed Astral Artists roster – for customized career development mentorship, marketing, performance opportunities and community engagement experience. A graduate of The Juilliard School, Hannah is a former prize winner at the Oliveira International Violin Competition – and recently made solo appearances with the Detroit Symphony, San Francisco Symphony and the Knoxville Symphony. Comprising violinists Pedro Rodriguez and Patricia Quintero Garcia, violist Inés Picado Molaresand cellist Justin Goldsmith, the Vera Quartet is former Graduate Quartet-in-Residence at Indiana University’s Jacobs School of Music – and will serve as String Quartet-in-Residence at the Curtis Institute of Music for 2018-2020. A graduate of the Fryderyk Chopin University of Music in Warsaw, Antonina is a four time recipient of the Polish Ministry of Culture and National Heritage prize for extraordinary artistic achievement. A graduate of The Juilliard School and the Curtis Institute of Music, Eric has recently performed with both The Philadelphia Orchestra and the American Ballet Theater. “Each year the bar rises for our National Auditions candidates …” Astral Artists Executive Director, Julia Rubio has told The Violin Channel. “Our four winners have excelled through a rigorous audition process … and we look forward to introducing the world to the next generation of great performers and thinkers,” she has said. The four winners were selected from several hundred applicants – and following a number of live audition and interview rounds. Second Prize ($10,000): Zoë Martin-Doike, 27 of the U.S.
Third Prize ($5,000): Leonid Plashinov-Johnson, 22 of the U.K.
One of the youngest violists in the competition, Hae-Sue Lee has studied with Roberto Díaz and Hsin-Yun Huang at the Curtis Institute since she was 13. For this competition, she played a 1793 Camillus Camilli viola, on loan from Díaz. Previously, Lee won first prize in the 2015 Johansen International Competition and in the Philadelphia Orchestra’s 2014 Albert M. Greenfield Competition. She was also a prizewinner at the Stulberg International Competition and the Lionel Tertis International Viola Competition. She has also participated in festivals including the Verbier Festival Academy, Banff Music Festival, Great Mountains Music Festival and Summit Music Festival. As first prize winner in the Primrose, she also will be invited to perform at a winner’s concert at Brigham Young University, presented in conjunction with the Primrose International Viola Archive, and will receive the CodaBow Marquise, by CodaBow. Jury members for 2018 include Lynn Harrell (Chairman), Roland Glassl, Kazuhide Isomura, Jon Nakamatsu, Nokuthula Ngwenyama, Xidi Shen, Lars Anders Tomter. For the Finals, each of the three violists performed Brahms Trio in A minor, Op. 114, in a chamber round on Saturday morning with cellist Lynn Harrell and pianist Jon Nakamatsu. For the evening concert, the competitors had a choice between playing the Viola Concerto by Bela Bartok, or the one by William Walton. All of them had chosen the Walton, and as I took my seat in the Colburn School’s Zipper Hall I truly wondered if I’d signed up for the Groundhog Day of viola concerts. Three Walton Concertos in a row — would the audience grow fatigued? And how about the orchestra? Along with rehearsals, the members of the Los Angeles Chamber Orchestra played a total of six Walton Concertos Saturday. And how would the competitors distinguish themselves, all playing the same concerto? 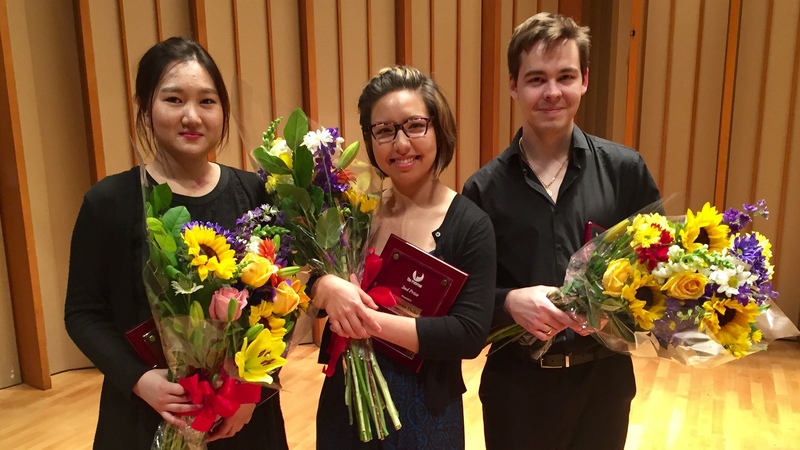 I need not have worried — each performance was unique and engaging, showing the high level and that made all three of these violists contenders for this top prize. The evening began with Zoë Martin-Doike, who was performing on a 1999 Stanley Kiernoziak viola, on loan to her from Mimi Zweig. Martin-Doike played with accuracy and assurance — as well as a lot of kinetic energy. A violist sitting next to me pointed out that Martin-Doike had made a number of unique choices, among them playing the first movement’s quadruple stops pizzicato instead of arco. Next was Hae-Sue Lee, who seemed well-connected to both the orchestra and conductor. Her first movement was well-played, but what caught my attention was the contrast she created, fading out of the first movement and then launching into the second. This was when she seemed to hit her stride, giving a punchy and intense performance that highlighted the rhythmic complexity of this movement. It was downright exciting — and she knew it, flashing a happy smile after the movement ended. In the third movement, she showed her ability to spin a long phrase, as well as a range of color and vibrato; the ending was captivating. Next was Leonid Plashinov-Johnson, who played on a 1995 Stefan-Peter Greiner viola, on loan from his teacher, Kim Kashkashian, from which he milked a beautiful tone. An expressive player, his high musical sense was on display throughout, and his stage presence was engaging. The orchestra overwhelmed his sound at times, and he probably lost marks for a few small stumbles. I’d still pay to see him play. If you’d like to see the evening performances of the Walton Concerto, Click here to watch on the competition’s Facebook page. It seems as if it was painless, even without problems. That cannot have been totally so. When there are changes in personnel that make up an ensemble, such as a string quartet of long standing, the process that takes musicians away and takes others in simply must be jarring. And the change in the Pacifica Quartet, the Indiana University School of Music’s faculty string quartet in residence, was dramatic: two of its long-time members left for other opportunities at one time. Two successors had to be found at one time. Well, now the ensemble is about a year into its changed membership. We’ve had several opportunities to hear the altered cast in performance. One can report, or at least I can report: all is well. On listening to the re-formed Pacifica last Friday evening in Auer Hall, I heard a world-class string quartet that is still a world-class string quartet, performing – as it has since I first had the privilege of hearing this remarkable chamber ensemble live or on recordings – at a supreme and distinctive level of quality. The unifying purpose remains. The precision of attack has not weakened. The carefully resolved interpretation is present. The sense of playing as a unit while allowing individual voices to shine through the total weave has been sustained. Certainly, one misses the familiar elements, now gone: second violinist Sibbi Bernhardssohn and violist Masumi Per Rostad; they were part of the package we came to know. But violinist Austin Hartman and violist Guy Ben-Zioni as added to the remaining first violinist Simin Ganatra and cellist Brandon Vamos, we’ve discovered, have kept the Pacifica a quartet of equally high stature. That was once again fully noticeable on Friday when the quartet performed Beethoven’s late String Quartet in A Minor, Opus 132, and then – with pianist Emile Naoumoff – Robert Schumann’s Piano Quintet in E-Flat Major, Opus 44. The Beethoven, one of those unfathomable creations emanating from the interior depths of the composer’s by-then soundless existence, has biographical roots. Beethoven had been gravely ill, even while engaged in writing it. The early movements reflect severe melancholy mirroring his response to the parlous physical condition. And then, Beethoven’s health improved. He changed the content of the quartet, casting away two gloomy movements and replacing them with three totally different in character, one of which he inscribed with the words (translated into English): “Holy Song of Thanksgiving to the Divinity by a Convalescent, in the Lydian mode,” the others with music containing a greater joy to express Beethoven’s rebounding spirit. Musicians take quite a journey moving through the music brought on by these musings. The Pacifica’s journey shifted powerfully from the sad and wistful and subdued to a hymn of reverence and, finally, to a celebration. Traveling along, one heard an emotional sojourn riveting for ears and heart, the composer’s thoughts distilled. The four musicians interconnected for a tour de force close-up of Beethoven’s super-sensitive mind in action. The very different Schumann Piano Quintet brought Naoumoff, the Pacifica’s faculty colleague from the piano department, to the Steinway. Professor Naoumoff is an incredibly gifted keyboard technician who easily makes the piano his submissive own. And that he surely did on Friday for a score that balances the pianist against the four string players, making each responsible for an equal share of what the music offers; the pianist provides half of the sound output, the string ensemble the other half. Performance becomes a balancing act. Friday’s four-versus-one quintet balanced, without doubt. Naoumoff, never afraid to set a listener’s ears ringing, kept his sometimes writ-large interpretive inclinations in sync with his string colleagues for a truly engaging, vibrant reading of Schumann at his most engaging and vibrant. The teamwork proved graceful and jubilant, worthy of the jubilant audience response that followed. All’s well with the remastered Pacifica and with their concert colleague, pianist Naoumoff. That was comforting to hear and good to let you know, if you weren’t there. Mauricio Fuks, professor of violin at the Indiana University Jacobs School of Music, has been appointed visiting professor at the prestigious Reina Sofía School of Music in Madrid, Spain. He will combine this appointment with his responsibilities as visiting professor at the Masters Academy in Kronberg, Germany, and as International Chair for Strings at the Royal Northern College of Music in Manchester, England. These appointments will take Professor Fuks to Europe twice a year. Grigory Kalinovsky, professor of violin at the Indiana University Jacobs School of Music, recently teamed with pianist Tatiana Goncharova to record the complete sonatas for violin and piano by composer Mieczysław Weinberg. The two-CD set is now available on the Naxos label. Weinberg is now recognized as one of the outstanding Russian composers of the second half of the twentieth century. Feted for his symphonies and string quartets, he also wrote a sequence of violin sonatas crucial to the development of his distinctive and elusive musical idiom. Shostakovich’s influence is evident in the Third Violin Sonata, as are Jewish melodic elements, while the Fourth Violin Sonata is alternately somber and hectic. Weinberg’s masterpiece is the Fifth Violin Sonata, symphonic in scale but subtle in form and containing some of his most affecting writing. Chris Howell | Herald-Times Layla Vamos, 10, practices a Joseph Haydn concerto during a private lesson last week with Mimi Zweig, director of the Indiana University String Academy. When Layla Vamos’ bow touches the strings of her violin, she doesn’t need to watch. Her body sways, and often her eyes close, allowing the music to take over while she plays. Joseph Haydn’s “Concerto in G Major” fills the walls of Mimi Zweig’s room in the round Music Addition building at the Jacobs School of Music. Zweig, the program director of the music school’s String Academy, watches and listens, correcting Layla’s stance and providing encouragement after a particularly clean section. Layla’s been playing the violin for years now and can hear when she’s a bit sharp — a tendency when pulling out of long notes. But by and large, the music flows from her 4-foot-nothing frame with an ease that comes from a thousand hours of practice. At just 10 years old, the incoming fifth-grader at University Elementary School has put in the time to be great. Or, at least, to be on her way to greatness. Now in its 32nd year, Indiana University’s String Academy allows children like Layla who wish to study violin and cello to realize their potential in a world-class academic setting, Zweig said. This year, 135 children are participating in the Summer String Academy, split over two sessions, with at least 20 students from Monroe County. There are also students from Iceland, Argentina, Uruguay, France, Mexico, Japan and China, among other countries, all living in the Forest Quad dormitory, eating at the Wright food court for lunch, just like college students. The students were each required to send in an audition tape to be selected for the program. Zweig attributes the String Academy’s worldwide lure to a top-notch roster of instructors and a reputation that regularly brings in world-famous musicians to perform. During the summer sessions, Zweig has secured nearly nightly concerts for the students, many with Hoosier ties to match this year’s “Made In Indiana” theme. “Parents are always looking for excellence in their education, and this is one of those hot spots,” Zweig said. Simin Ganatra can speak to both sides of that argument. Ganatra is a renowned violin player in her own right, as well as a professor of practice at the Jacobs School of Music. She is also Layla’s mother and a big fan of the String Academy, first enrolling her daughter at age 6. This is Layla’s second time through the summer session. When Layla was 3 or 4 years old, Ganatra was rooting for her daughter to choose the cello, the instrument of choice for Layla’s father, Jacobs professor of practice Brandon Vamos. But Layla gravitated toward the violin (because, as Layla explains it, that’s what the girls in the house played). Layla is reaching a critical age in her development as a violinist. The young girl who enjoys playing outside and is a fan of dogs is doing all the right things to be great, Zweig said, as are the other kids who are committing themselves to their craft this summer. By around age 12 or 14, students who have “caught the bug” should be preparing for a rigorous life of training over the coming years, Zweig said, a life current Jacobs students know well. Zweig has modeled String Academy participants’ days in much the same way. In the morning, they practice from 9 to 11 a.m., then attend chamber music coaching for the next two hours. This is where students break out into string quartets based on levels of ability. After lunch at the food court, students have private lessons from 2 to 4 p.m., and then practice for two more hours before heading back to the food court for dinner. Many flourish, and Zweig said she’s had more than a few String Academy alumni later attend Jacobs as full-time IU students. Layla closes her eyes and begins again with a confidence beyond her years. Mom nods in approval. “Good! That’s so beautiful,” Zweig says. Layla’s bow flashes back and forth as the fingers on her left hand slide along the strings. Her toes curl slightly into her flip-flops at the crescendo, and Zweig instructs her to hold the long notes longer. “More bow,” Layla responds quietly but confidently. To learn more about the String Academy’s fall sessions, visit http://music.indiana.edu/precollege/year-round/strings/index.shtml. The New York-based Enso String Quartet has today announced the appointment of 30 year old violinist, Yura Lee as their new 1st violinist – from the commencement of the 2016-17 season. She will replace Maureen Nelson – who will leave the ensemble to take up a position with the Saint Paul Chamber Orchestra. A graduate of the Indiana University and the New England Conservatory, Yura is a former major prize winner at the Leopold Mozart, Indianapolis, Hannover, Kreisler, Paganini and ARD International Violin Competitions. “I feel very lucky that I get to spend time with, and explore this music with the Ensō Quartet … they are some of the most amazing musicians and people that I have been fortunate enough to know …” Yura has said. Formed at Yale University in 1991, the Enso Quartet are former 1st prize winners at the Concert Artists Guild and Banff international String Quartet Competition. “Discovery” is the key word at Focus! concerts. For 32 years, the festival has been dishing up the most delectable new-music smorgasbord in New York City. This year’s event celebrated the centennial of distinguished American composer, teacher, and writer Milton Babbitt+ (1916- 2011). The four musicians of the Verona Quartet were encountering his sophisticated 12-tone language for the first time—although a listener might never have suspected as much. Their electrifying realization of the work’s Stravinsky-esque drive and Bartókian rhythms and pizzicatos finally unlocked the secret to a composer whose music I had heretofore appreciated mostly for his puckish titles: e.g., Swan Song No. 2, It Takes Twelve to Tango, Minute Waltz (or 3/4±1/8), Sheer Pluck (for guitar), and Whirled Series (for alto sax and piano). Only three years into its formation, the Verona Quartet has straddled the professional and academic worlds, performing across North America, Canada, Asia, and Europe, amassing top awards in numerous international competitions, and playing at Wigmore Hall in London, the Kennedy Center in Washington, D.C., and this month at Tully Hall. Next season will mark its Carnegie Hall debut, in Weill Hall. Studies with the Juilliard String Quartet+ led to being named the School’s graduate resident string quartet last September, a post that will continue next season. As the designated Lisa Arnhold Fellows, they have been coaching with the JSQ and will assist them in chamber-music teaching. Also among their alma maters are Indiana University’s Jacobs School of Music, Cleveland Institute of Music, Oberlin Conservatory of Music, Rice University’s Shepherd School of Music, and Eastman School of Music. At Indiana the Verona was the first graduate quartet-in-residence and worked chiefly with the Pacifica Quartet+, which violist Rojansky credits with the encouragement to be a quartet “right from the start,” helping the group to find its voice and pick the right pieces to continue its growth. “They were a huge influence on us, and they continue to be, to this day.” Perhaps working with the Pacifica, which performed and recorded the 15 Shostakovich quartets so memorably, will lead the Verona players to follow suit. Her colleagues nod heartily in agreement. The Verona Quartet will perform Haydn’s Quartet in B-flat major, Op. 50, No. 1, Mendelssohn’s Quartet in E minor, Op. 44, No. 2, and Bartók’s Quartet No. 5 at Alice Tully Hall, May 7 at 7:30 p.m.
I’m almost ashamed to admit that this is the kind of recording I might have passed on for review had I still been writing for a major classical journal—not because I dislike the music, but on the contrary, because there are so many performances of these Sonatas and Partitas out there, and I’ve heard so many of them that I was afraid of Bach Overload. And, from the first notes of this new release, I was worried by the fact that Kaplan seemed to take these pieces at not merely a leisurely pace but a granitic one, almost like Otto Klemperer’s recording of the Bach St, Matthew Passion. But like Klemperer’s Passion, Kaplan creates here an entire world of feeling and emotion. For him, these are obviously not just Bach pieces to be played but major, monumental structures to be explored and savored, note by note and phrase by phrase. By the time you finish just one complete Sonata, you are emotionally drained, but you realize there are two more sonatas and the three partitas yet left to hear. It is difficult to describe in words exactly what Kaplan does with this music; an objective description really isn’t enough, but I will try. To begin with, he plays in a more modern style. Kaplan plays a 1685 Stradivarius called “The Marquis” after the Marchese Spinola whose family owned this instrument for generations, and although he does not use straight tone, he does employ a light, fast vibrato which gives the illusion of straight tone without sacrificing beauty of sound. More importantly, to my ears, is that he knows how to “build” each piece, using both its structure and its emotional message (to him) to convey something far, far deeper than what one sees in the naked music. It is as if every note, every phrase of these monumental works has something to say to Kaplan and, in turn, he has something to say to you about them. It took me a while to figure out who Kaplan’s tone reminded me of. It reminds me of Isaac Stern, but Stern in a really fired-up mood. I have to say that I was never much of a Stern fan, not because he couldn’t play the violin well—he certainly could—but because I found most of his performances very generic-sounding. There is nothing generic about Kaplan; on the contrary, he is an individualist of the highest order. When Kaplan played the entire Sonatas and Partitas over two evenings at Ostin Hall in Los Angeles in October 2000, at a time when he was on the faculty of UCLA, Los Angeles Times critic Richard S. Ginell praised him for his “near-perfect intonation, even in the most treacherous multiple-stopped chords; expressive rubatos in the slower dances; sufficiently graceful rhythm in others. He could dig trenchantly into the Sonata No. 2’s great Fuga, finding the climaxes and crunching them with satisfying, robust attacks.” This is perhaps a bit more of a “macho” description of what Kaplan does in this music than I would say, but it’s very close. In style, he seems to me to combine the best of the Italian and German approaches to violin playing in that his long-lined passages have extraordinary lyricism yet do not collapse under the weight of the slow pace he chooses, while the fast movements have the brightness of sound and that identifiable “lift” to the rhythm that the best Italian violinists can bring to this music. Prior to hearing Kaplan’s recording, my benchmark performances in these works were the ones recorded by the great Dutch violinist Sigiswald Kuijken way back in 1981. They were, I believe, the very first recordings made of these works using straight tone, and Kuijken was able (as so few Historically-Informed violinists can do) to make the violin sing without sounding whiny. Going back and relistening to Kuijken’s performances after hearing Kaplan’s, I still find much to admire insofar as the unusual approach is concerned (there is, as I’ve said many times, no conclusive evidence that 18th-century violinists played with constant straight tone or even mostly with straight tone), but because he is using constant straight tone, Kuijken is physically incapable of achieving the kind of emotional impact that Kaplan brings to this music. Now, I’m not saying that no straight-tone violinist can achieve anything close to what Kaplan gives us, but I’m not holding my breath, either. Regular readers of my reviews know my philosophy: it’s the musical approach, not the instrument or the technique used, that brings a piece of music to life. If you don’t really love the music and get deep inside it, all your audience is going to hear is a nice progression of notes, possibly played with a good legato and spiffy stops but not much more. I’ll take an artist—a real artist—like Kaplan over a more clinical approach any day of the week. As I was preparing to upload this review online, I discovered that this is Kaplan’s second recording of these works. The first was apparently made for Mitch Miller Music (14630-2) in 1991-92—an image is inserted here—but I’ve never heard it or even seen a review of it. (Kaplan also recorded Paganini’s Violin Concerto No. 1 and Wieniawski’s Concerto No. 2, with Miller conducting, for the same label.) I can only imagine that he must have grown in this music over the years or he wouldn’t have insisted on re-recording it. Incidentally, this recording was made in 2011, so it apparently took a few years to get the nod for release. As noted earlier, I purposely avoid most new recordings of these great works so I can’t say with any certitude that this recording is the best out there, but by way of comparison I also reviewed Rachel Barton Pine’s new version of them (Testament: Complete Sonatas and Partitas for Solo Violin, Avie AV2360). Much as I’ve loved her in past recordings, her insistence on using straight tone in early music hamstrings her emotional projection. Her performances are more deeply felt than Kuijken’s, but every time you get the impression that she is digging into the score, all her instrument is capable of projecting is a shallower version of the emotion that Kaplan gives us in spades. One good example is the “Siciliana” of the first Sonata. Barton Pine plays it with superb balance and her patented clear tone, whereas Kaplan, who extends it more than a minute longer, is doing something entirely different. He is not playing music; he is communicating something deep and personal. Indeed, this is even true of that sonata’s concluding “Presto,” played at the same tempo by both violinists. Barton Pine has a certain swagger, she makes the music dance, but Kaplan views it as yet another way of communicating his inner feelings, building it phrase by phrase in a slow crescendo. This is not to say that Barton Pine’s recording is shallow. In comparison to many a HIP violinist, she has a unique sparkle regardless of playing method used, but compared to Kaplan it is like hearing Montserrat Caballé sing Massenet’sÉlégie before turning to Feodor Chaliapin, who tears your heart out. There is good, and there is great. Both Kuijken’s and Barton Pine’s performances are ones you will listen to occasionally, but you’ll go back to Kaplan’s, in whole or part, much more often. This is a great recording, plain and simple.